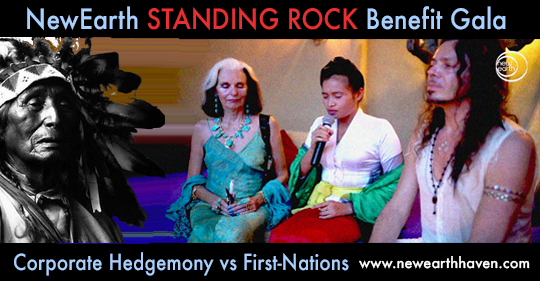 Presided over by Balinese High Priestess Ida Resi, Yakama Nation Chief-Justice Ted Strong and Sacha Stone. Hundreds of people gathered in Bali at NewEarth Haven in solidarity with our brothers and sisters at Standing Rock. We are grateful to the Balinese High Priestess Ida Resi for her blessings, and to the video link message from Yakama Nations Chief Justice Ted strong who joined us by video link representing the great Navajo Lakota and Dakota nations of the great plains of North America. The issues at stake which we’ve all been blessed to witness at Standing Rock affect every man woman and child whether we know it or not. The noble truth worries were standing on the front line are doing so in full knowledge that if the corporation bands and treasonous elements within our own governments get away with such criminal action today it will spell catastrophe for all people of the world in the days ahead. These brave warriors may neither amongst the First Nation peoples of the great plains of North America are self-confessed protectors and not protesters. But even if they were protesting is there not a duty of care for all people to protest against tyranny and travesty when it rears its head? Is it not the responsibility of awakens souls and concerned citizens to take issue with our so-called leaders when they put profit before people in violation of their mandate making unilateral decisions which destroy our environment and eviscerate our civil liberties. At times like these we should remember that living men and women of the living soil do not require human rights, we are born with the universal right flourish and prosper upon the surface our living planet. The protectors and Standing Rock come together in vast numbers today in full alignment with ancient prophecy and are putting themselves against the badges the guns the tanks and the heinous actions of men and women in costume who are blindly following orders which issue from criminal conspirators, conspirators who abrogate and derogate all treaties in the natural justice which are supposed to be the cornerstone of our civilization. Conspirators who are willfully committing treason and fraud against the true sovereign which has always been the living men and women of the living soil. The Standing Rock saga invites each of us to now draw our own line in the sand, it invites us to step outside of fictitious lives governed by fictitious statutes, codes, ordinances and the spellbinding engineered by corporations masquerading as government’s. People of the world do not need to ask permission from any imposed authority so long as they remain in honor. Rather it is institutions of the world governments of the world and the bureaucrats and agents who propagate these vast fictions you need to take stock and recognize the people of the living soil will no longer be railed and manipulated into complicity with the evils of profit and of power.